After a great night's rest, I set off in good spirits and good weather as I retraced my steps to join up with the Pennine Way where I had left it the day before. 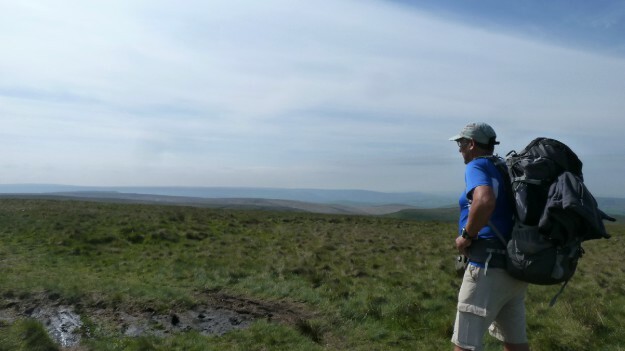 This section of the way was described in the book as 'not the greatest day's walking on the Pennine Way'. 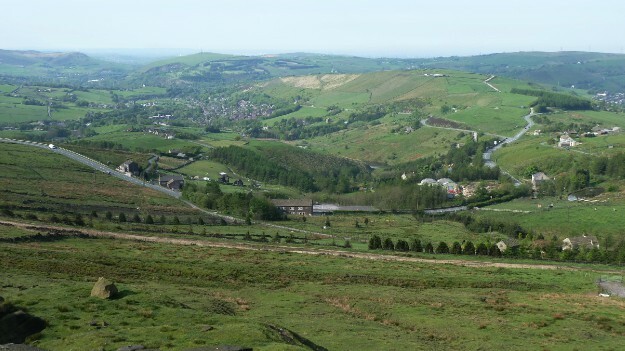 The author complained of the abundance of reservoirs and the fact that 'the Lancashire and Yorkshire conurbations press in too close to the Pennine Way and almost smother it'. Because of this, I wasn't expecting much out of the day but in the end, I thoroughly enjoyed myself. Although there were towns and villages in view most of the day, and a number of roads to cross, including the M62, which is achieved by a narrow footbridge suspended above the six lanes of traffic, I found the scenery more than made up for any perceived shortcomings. 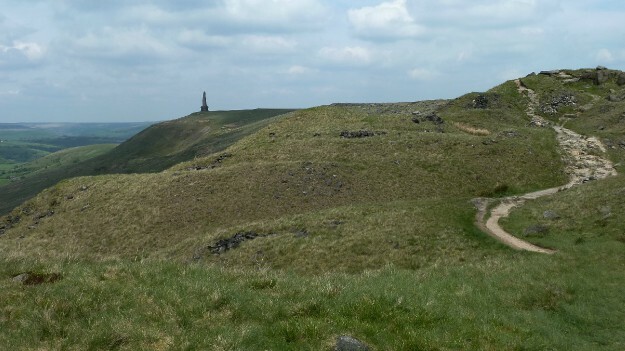 It was also nice to have a relatively flat day to give the legs a rest and I thoroughly enjoyed striding out along the gritstone of Millstone Edge and Blackstone Edge before arriving around midday at the White House pub, situated on the Rochdale to Halifax road. As I approached the pub I recognised the two walkers I had spoken to on Kinder Scout on the first day, sitting outside the pub enjoying a pint and I joined them for a chat after purchasing a drink from the bar. Because of my very early start the previous day I had not seen them at all and we talked about various aspects of the walk so far including our good fortune with the weather. The forecast was still predicting rain but so far this hadn't materialised but it was still a concern nagging at the back of my mind as memories of the rain penetrating my tent's flysheet on the day before the walk returned. 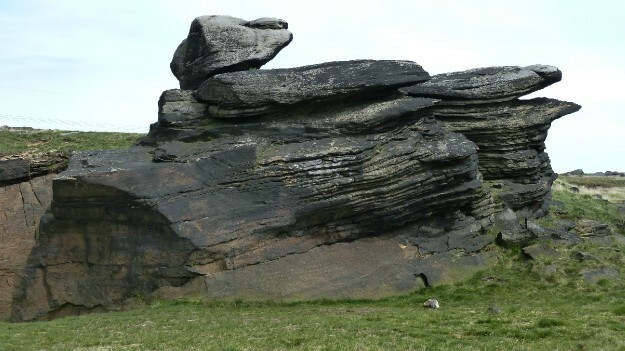 I knew that I had to resolve the problem if I was to have a chance of finishing the walk and I had decided to try and purchase some waterproofing spray from the camping shop in Hebden Bridge, when I arrived later in the day. The two walkers finished their drink before me and set off again leaving me to sit quietly and contemplate the walk so far and it wasn't long before I too set off along a fairly long, flat section alongside a number of reservoirs. I soon caught the two walkers who had stopped for another rest, with one stretched out in the grass at the side of the path with his hat covering his face. I made a joke about having too much to drink at the pub and carried on, it was the last time I was to speak to them, although I did see them in the distance behind me the following day. 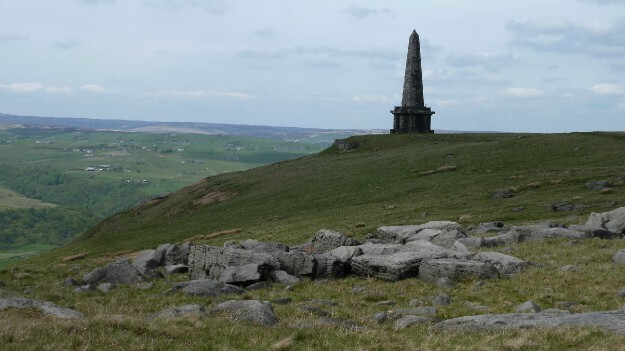 Before long, the tall obelisk of Stoodley Pike came into view in the distance but it wasn't too long before I was climbing up to the foot of the 120ft tall tower, which marks a change in the terrain, with peat moorland giving way to limestone country. After a relatively pastoral section, I arrived at the Rochdale canal and left the Pennine Way to walk along the tow-path into Hebden Bridge where I located the camping shop and purchased a large spray can of waterproofing spray for the tent and a new gas canister, as mine seem to have mysteriously emptied despite having used it only two or three times. I walked along the main road out of the centre of town and as I reached the turn off for my guesthouse, was intrigued to see a sign in someone's front window which said 'Keep Hebden Local', a rather ominous greeting for a visiting stranger. I was highly amused by the sign which reminded me of a UK black comedy series called The League of Gentlemen, where the owners of the 'local' shop in the fictional town of Royston Vasey enquire of their customers 'are you local?, and upon being told that they are not, the customers mysteriously disappear and items of their clothing and personal belongings later seen burning on a bonfire outside the shop. I took a photo of the sign to send to a friend of mine who likes the programme and approached the guesthouse and as I raised my hand to press the doorbell, was surprised when the door opened and a woman's face appeared before I had a chance to press the bell. This was becoming strange! Registering my surprise, the woman explained that she had seen me walking up the road towards her house and had tried to attract my attention because the entrance to my 'room' was via a gate at the bottom of her garden, which I had passed before reaching her front door. I walked back down the road a short distance and entered the garden and the entrance to my 'room', which as it turned out, was a separate, lower part of the house. After being given a number of 'rules' to follow by the rather fussy proprietor, I set about sorting my gear and showering before I returned to the town to look for a pub with wifi access, as the signal in my part of the guesthouse was very weak. This I did after walking around the town a couple of times and I managed to send messages to my wife and parents before my very mediocre meal arrived at my table.